Is a Mauxie Dog the Right Maltese Mix for You? between a Dachshund and a Maltese. These hybrid dogs are recognized by the American Canine Hybrid Club and can be registered on their website. They are a unique, little Maltese dog breed mix that comes in all shapes and sizes and is rare to find. 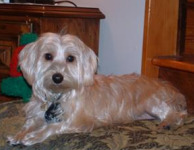 Read more about the Maltese Dachshund mix below to see if this is the right Maltese mix for you. Do you have a Mauxie? Click here to join us on Facebook and post pictures of your lil cutie for everyone to see! These dogs take on the temperament of both Dachshunds and Maltese. They are lively, affectionate, and bold little dogs. Maltese Dachshund dogs are very curious and sometimes can become mischievous; which can make them difficult to train. You should socialize and train them to combat compulsive barking and digging. They are great travel dogs and make a good watchdog. These dogs do best with older, considerate children as they are moderately protective and sometimes quick to bite. Most people find them to have a willful and clownish personality. If you already have a Maltese Doxie mix or know someone that does, check out these unique gifts for dog lovers below. If you like a wide variety of colors and a unique shape, than this Maltese mix might be right for you! 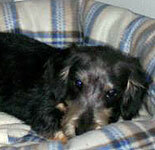 Dachshunds may be solid-colored tan or yellow or bi-colored deep black, brown, or gray with areas of bright chestnut. There are also piebald, speckle-streaked, or harlequin varieties. When you mix this with a white Maltese, you get varying shades and patches of color. You might say that they are like a box of chocolates, you never know what you're gonna get. Hair is usually straight and long. Therefore, they need daily combing and brushings. Some will shed, while others will not. Since Dachshunds come in many sizes (Toy, Miniature, and Normal), full grown Dachshund Maltese mixes can weigh anywhere from 6-15lbs. Find the perfect dog for you. Learn about other Maltese mix dogs. She is a 7 month old lively Maltese Dachshund mix puppy. She has a sweet temperament but takes a little bit of time warming up to strangers. Enter your search terms Looking for something?